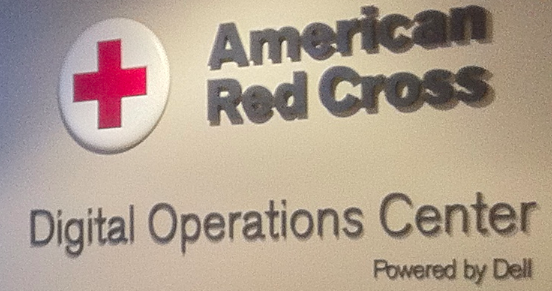 The Digital Operations Center at the American Red Cross is an important and exciting development. I recently sat down with Wendy Harman to learn more about the initiative and to exchange some lessons learned in this new world of digital humanitarians. One common challenge in emergency response is scaling. The American Red Cross cannot be everywhere at the same time—and that includes being on social media. 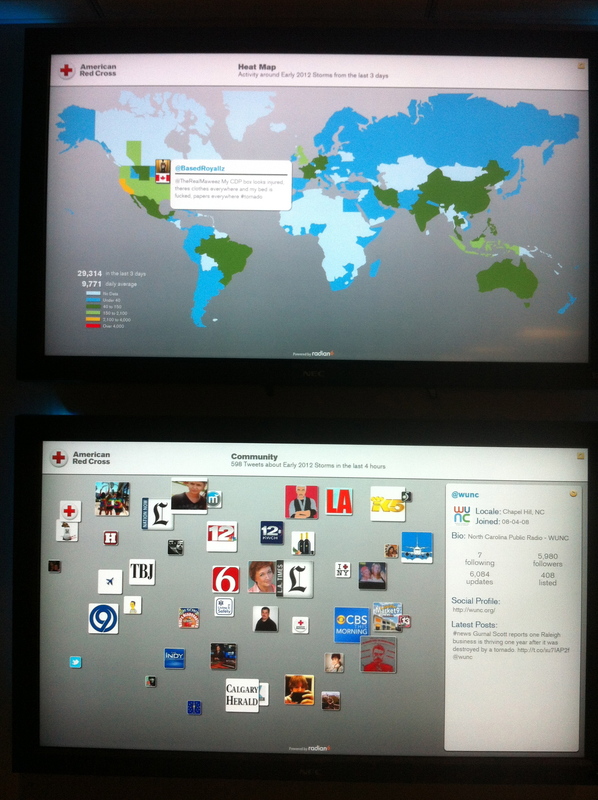 More than 4,000 tweets reference the Red Cross on an average day, a figure that skyrockets during disasters. And when crises strike, so does Big Data. 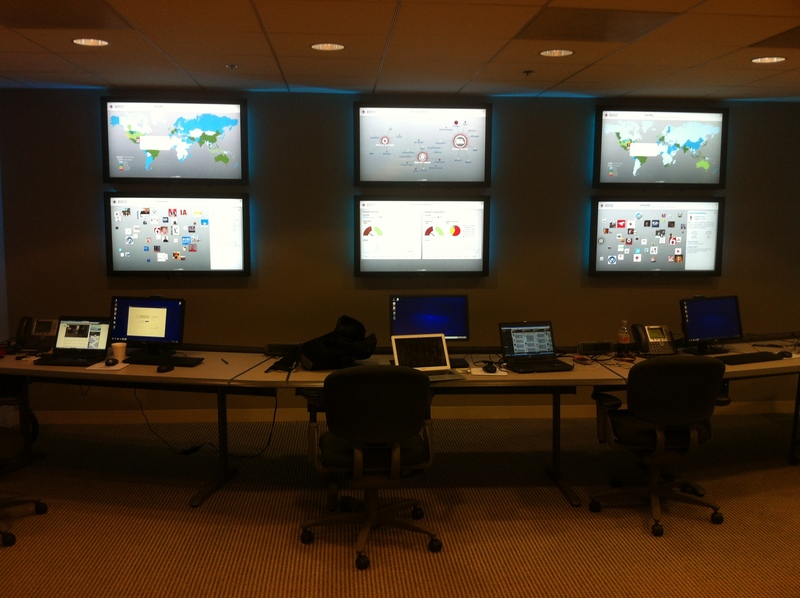 The Digital Operations Center is one response to this scaling challenge. Sponsored by Dell, the Center uses customized software produced by Radian 6 to monitor and analyze social media in real-time. The Center itself sits three people who have access to six customized screens that relate relevant information drawn from various social media channels. 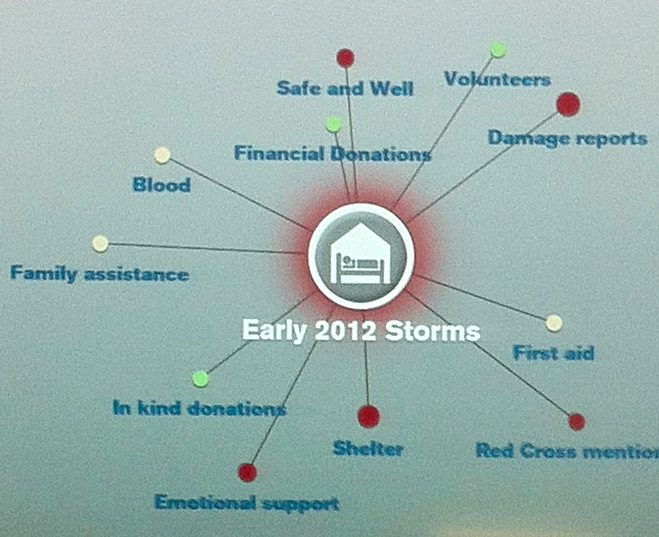 The first screen below depicts some of key topical areas that the Red Cross monitors, e.g., references to the American Red Cross, Storms in 2012, and Delivery Services. Circle sizes in the first screen depict the volume of references related to that topic area. The color coding (red, green and beige) relates to sentiment analysis (beige being neutral). 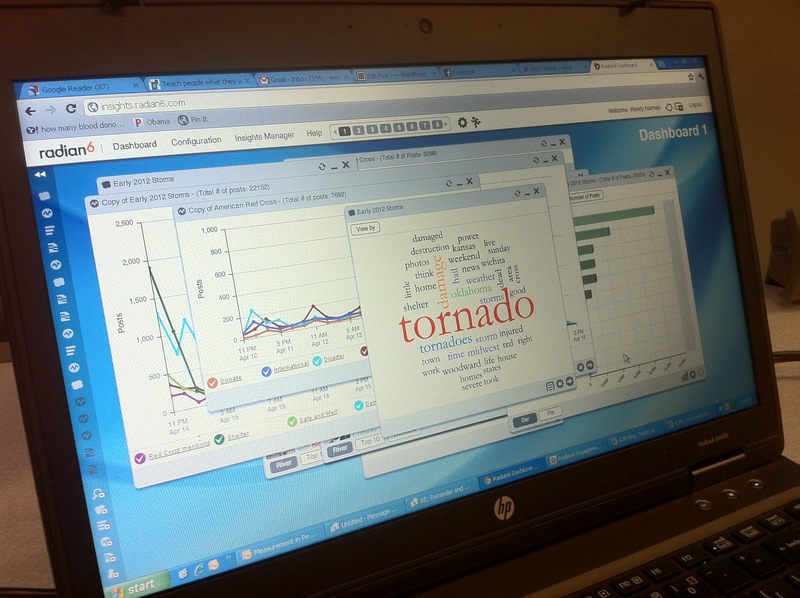 The dashboard with the “speed dials” right underneath the first screen provides more details on the sentiment analysis. Lets take a closer look at the circles from the first screen. The dots “orbiting” the central icon relate to the categories of key words that the Radian 6 platform parses. You can click on these orbiting dots to “drill down” and view the individual key words that make up that specific category. This circles screen gets updated in near real-time and draws on data from Twitter, Facebook, YouTube, Flickr and blogs. (Note that the distance between the orbiting dots and the center does not represent anything). 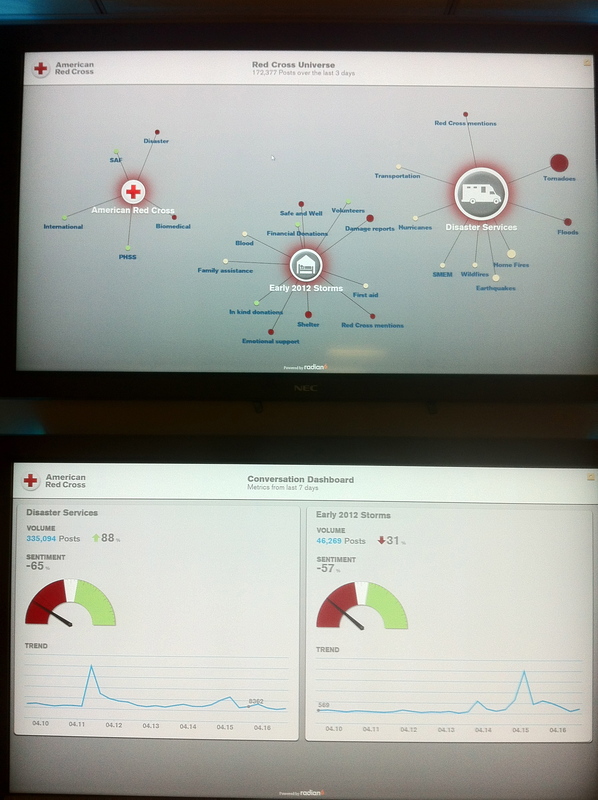 An operations center would of course not be complete without a map, so the Red Cross uses two screens to visualize different data on two heat maps. The one below depicts references made on social media platforms vis-a-vis storms that have occurred during the past 3 days. The screen below the map highlights the bio’s of 50 individual twitter users who have made references to the storms. All this data gets generated from the “Engagement Console” pictured below. 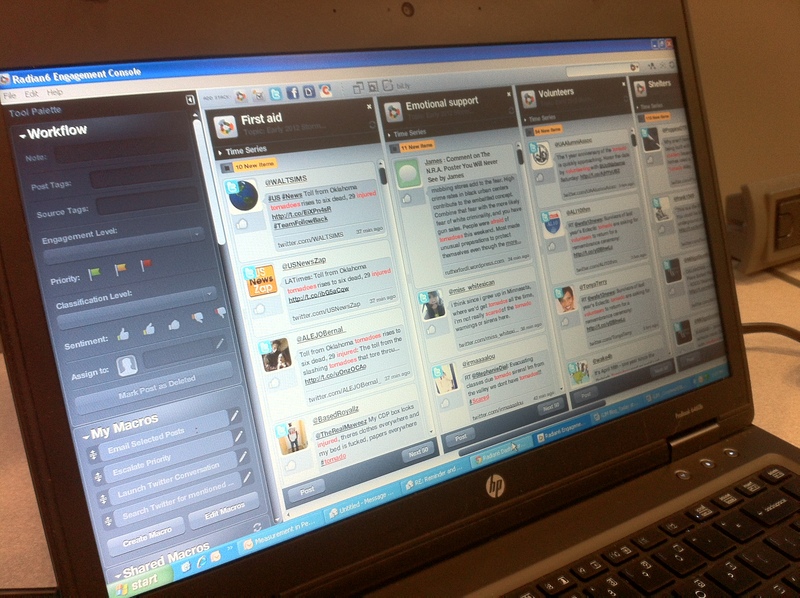 The purpose of this web-based tool, which looks a lot like Tweetdeck, is to enable the Red Cross to customize the specific types of information they’re looking form, and to respond accordingly. Lets look at the Consul more closely. 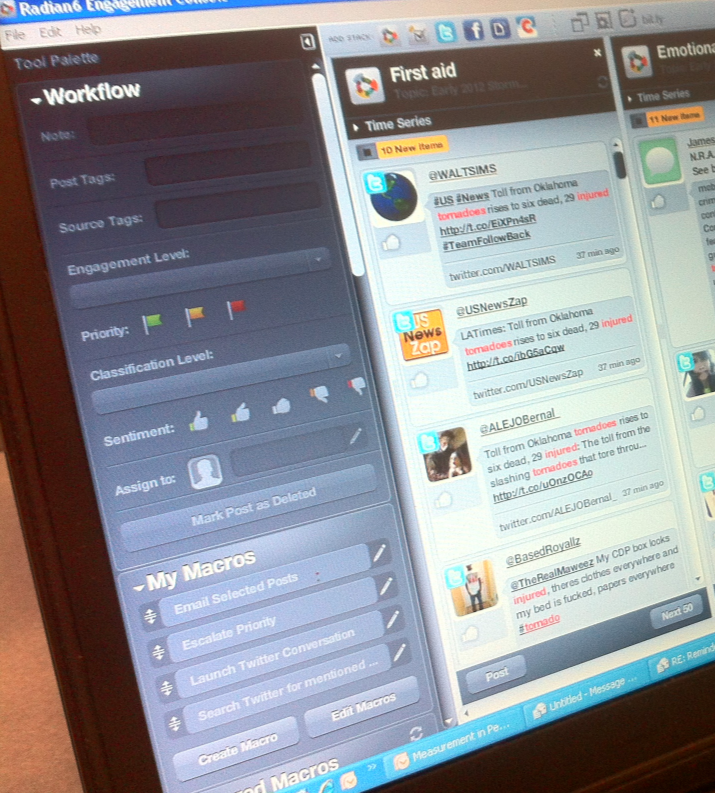 In the Workflow section on the left, users decide what types of tags they’re looking for and can also filter by priority level. They can also specify the type of sentiment they’re looking, e.g., negative feelings vis-a-vis a particular issue. In addition, they can take certain actions in response to each information item. For example, they can reply to a tweet, a Facebook status update, or a blog post; and they can do this directly from the engagement consul. Based on the license that the Red Cross users, up to 25 of their team members can access the Consul and collaborate in real-time when processing the various tweets and Facebook updates. The Consul also allows users to create customized timelines, charts and wordl graphics to better understand trends changing over time in the social media space. To fully leverage this social media monitoring platform, Wendy and team are also launching a digital volunteers program. The goal is for these volunteers to eventually become the prime users of the Radian platform and to filter the bulk of relevant information in the social media space. This would considerably lighten the load for existing staff. In other words, the volunteer program would help the American Red Cross scale in the social media world we live in. Wendy plans to set up a dedicated 2-hour training for individuals who want to volunteer online in support of the Digital Operations Center. These trainings will be carried out via Webex and will also be available to existing Red Cross staff. As argued in this previous blog post, the launch of this Digital Operations Center is further evidence that the humanitarian space is ready for innovation and that some technology companies are starting to think about how their solutions might be applied for humanitarian purposes. Indeed, it was Dell that first approached the Red Cross with an expressed interest in contributing to the organization’s efforts in disaster response. The initiative also demonstrates that combining automated natural language processing solutions with a digital volunteer net-work seems to be a winning strategy, at least for now. After listening to Wendy describe the various tools she and her colleagues use as part of the Operations Center, I began to wonder whether these types of tools will eventually become free and easy enough for one person to be her very own operations center. I suppose only time will tell. Until then, I look forward to following the Center’s progress and hope it inspires other emergency response organizations to adopt similar solutions.